Here’s one for followers of the sweet science: Pacquiao vs. Margarito at Cowboys Stadium, Arlington, Texas, on November 13, for a vacant super welterweight title. The Filipino phenom was supposed to face American Floyd Mayweather Jr. in the ring for what could be the fight of the century, but Mayweather would not hear of it; he would not even admit that the second round of negotiations for the fight ever took place. Mayweather would say otherwise to anyone who would bother to listen, but the boxing world knows that he has clearly run out of ridiculous reasons why he would not lace up against Pacquiao for a record fight purse of up to $40 million for each fighter. 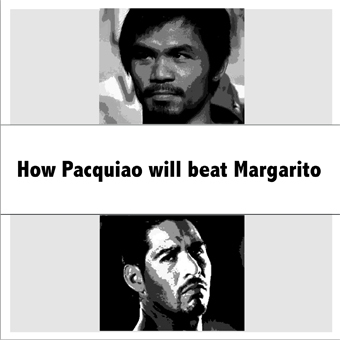 The breakdown of negotiations set the stage for Pacquiao vs. Margarito, two fighters who are both willing to fight and ready to rumble. The world’s best fighter against a tough warrior who is out to prove he is not a cheater — and, not incidentally, another fighter Mayweather has avoided fighting for years. A raging Pacific storm against a Tijuana tornado. David against Goliath, with a twist — it’s Goliath, the bigger man, who is the underdog. Power against power. Slugger against brawler. Size matters, yes, but speed kills.